Voters at Awka South council area wanting to be registered. There are indications that more than one million voters from Anambra state may be disenfranchised in the governorship election coming up November 18 this year and those of the 2019 general elections. This is the likely fallout from the glaring ineptitude so far observed from the ongoing continuous revalidation and registration exercise in the state. inability of many eligible voters to get their names registered in the ongoing continuous voter registration exercise in the state. The exercise is characterized by widespread agony and inability of many eligible voters to get registered. It was a tale of agony, suffering and frustration, particularly as the two-day public holiday declared by the state government went waste under their very eyes as they yielded no meaningful result in terms of the registration of the general populace and civil servants who thronged the registration centres to get registered or collect their Permanent Voters’ Cards, PVCs. There was massive turn out of eligible voters across various centres designated by the Independent National Electoral Commission (INEC) for the exercise. This was as should be expected as the state government had, during the 2017 Workers Day Celebration, declared May 8 and 9 as public holidays to enable the state workforce partake fully in the exercise. While Governor Willie Obiano and other All Progressives Grand Alliance (APGA) stakeholders were busy mobilising voters for the exercise, other political parties and their aspirants from the state were conspicuously absent and appeared unconcerned about the exercise. 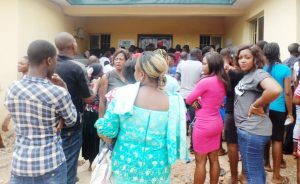 Orient Daily gathered that less than 30 persons were registered daily in most of the registration centres in Anambra, with many expressing bitterness and wondering why the state government did not make a special arrangement with INEC to deploy more hands and machines before declaring public holidays. Some of the people who spoke to Orient Daily expressed disappointment with the poor arrangement and asked the government to act quickly to ensure that the two-day holidays were not a waste. They wondered why some local government areas as big as Aguata, Awka South, Onitsha North and South, among others, would have only one center, expressing fears that many persons would be disenfranchised if the excise is not decentralized further to more centres. At Aguata council area, for example, more than one thousand eligible voters were sighted scampering for attention at INEC office, Ekwuluobia. Eligible voters at the centre, made up of mainly youths that just turned 18 and few adults were observed lamenting bitterly about the delayed process. Two ladies, Blessing Udensi and her twin sister, Prisca Udensi, while sharing their experiences with Orient Daily, accused INEC officials of corrupt practices, pointing out that they were being financially induced by APGA officials to attend to their family and friends. “We have been standing under the scorching sun for over seven hours now. My sister and I came here since 6 am. We would have gone home to eat because we are hungry and thirsty but we did not because INEC officials assured us that we would be attended to before 1 pm. “We are number 37 and 38 on the list. If they had been going by that list, we would long have finished registration and gone home. But the last number we heard them call and attend to was number 15”, Blessing lamented. A civil servant who gave her name as Emily Onyekachi threatened to boycott the exercise if the ugly experience persisted. At Awka South council area, Orient Daily observed that the centre has only one registration machine with another backup to attend to over two thousand voters clustered at the centre. According to Mr. Ifeanyichukwu Anikwe, a retiree, who said he had visited the INEC registration centre at Amawbia severally, said there was no single day the registrants were able to register up to thirty persons. “I have visited this venue four times in order to replace my lost voters’ card. However, there is no single day or time you come and you get attention. They usually commence at 10 a.m and end at 3.30 pm. Last Friday, for instance, I was the 27th person to arrive here. I came at 6.59 am. They said we should hang around as they would only register thirty persons and close for the day. “However, only ten people were later attended to out of thirty of us whose names were earlier compiled on their list. They idled all through, walking around complaining of one thing or the other. If they don’t complain of lack of effective network link, they would say that their computer system has malfunctioned. At a time, they advised us to go home and return the following day, promising to continue on that list. On arrival, the following day, Monday, I arrived by 8.35 a.m, and saw a list already containing fifty-seven names” he lamented. Also speaking, Chibuike Okafo, a lawyer who was at the centre to replace his lost card said “the process is too slow. Those coming to obtain new voters cards having just turned 18 years and others seeking replacement to their misplaced cards or collection of permanent voter’s card are forced to queue in one line, and write their names on an exercise book provided by INEC. “When I came here at 6 a.m, there were thirty-six names on the list even though we were less than the number on the queue. They told us that the list would be judiciously followed to ensure orderliness and transparency. But at a point, we discovered that the list was suspended without giving us any reason. We also found that some persons, whose names were not on it were allowed entrance into the registration room after ‘exchanging handshake’ with officers at the door. “We are tied here. It’s too bad. This is an insult. How can I abandon my chamber to be here in futility? Look at the large crowd of people. Do you think they can conclude it in months if they should continue this way? A civil servant, Mr. Udeh Kenneth however described the process as awkward and cumbersome. The Transition Committee Chairman for Awka South Local Government Area, Mr. Leo Nwuba called on the Independent National Electoral Commission to provide more equipment for easier capturing of voters. Nwuba noted that the aim of the two-day public holidays declared by the state government to enable civil servants participate in the ongoing exercise would be defeated if the machines made available cannot attend to the number of people that came out for the exercise. He also called for the spread of the exercise to ward levels to reduce pressure at the local government offices so that many citizens will not be disenfranchised by the present arrangement. The experience was not different at the registration centre at Dunukofia local government where many prospective voters were seen struggling to secure their voters’ cards. As at 11 am, a large crowd was seen scampering to gain access into the main building where the registration was ongoing, while INEC staff were seen addressing the people. Many others were also seen trooping out in apparent disappointment, having waited hopelessly to no avail. One of the INEC officials who preferred anonymity stated that the exercise was going on well. He explained that the surge was as a result of the two-day public holidays declared in the state. At the Oyi local government, the story was largely the same with many still unregistered as at 2 pm when our reporters visited. Those who were seen going home described the exercise as a total sham, wondering why they were asked to go when it was not yet the official closing time. “I had to come back today because I was unable to register yesterday, yet I was asked to go again without being registered”, Kenechukwu Uzoma, who said he just turned 18 years said. Another woman, Martha Ejike, who complained she spent about N300 to get to the registration centre from Umunya where she lives, vowed not to come back for the exercise again. When our reporter approached one of the officials on why they had to close before time, he said the official mandated to speak to the press was not on seat. Reacting, the INEC spokesperson in the state, Frank Egbo said the number of machines and staff was a policy issue that could only be handled at the INEC headquarters. “It is a policy issue that can be attended to by Abuja. It is a nationwide exercise and no state is giving a preferential treatment. Meanwhile, Governor Willie Obiano who also monitored the exercise in the three senatorial zones of the state, registered displeasure over the process and called on the Independent National Electoral Commission, INEC to step up operations by putting in place necessary measures to fast track the process. Among the Council areas where the governor monitored the exercise were Orumba North and Aguata Council areas in Anambra South Senatorial District, Anaocha and Awka South in Anambra Central and Oyi and Onitsha North in Anambra North District.